토기 융기문 발(土器 隆起文 鉢)은 부산광역시 영도구 영선동 패총에서 출토된 신석기시대 초기의 토기로, 크기는 높이 12.4㎝, 지름 16.4㎝이다. 이 토기는 구연부 한 쪽에 짧은 주구가 부착되어, 내용물을 담아 따를 수 있고 구연부 밑으로 융기된 장식무늬가 있다는 점이 특징적이다. 장식무늬는 덧띠문(점토대)를 W자형으로 붙인 뒤, 이 덧띠문을 띠모양으로 눌러 눈금을 새겨 장식효과를 높이고 있다. 바탕흙은 점토질로 황갈색을 띠며, 아래쪽으로 내려올수록 검은색을 띤다. 이러한 토기는 신석기시대 전기에 제작되었는데, 같은 부산광역시 영도구 동삼동 패총에서도 융기문토기가 발견되기도 하였다. 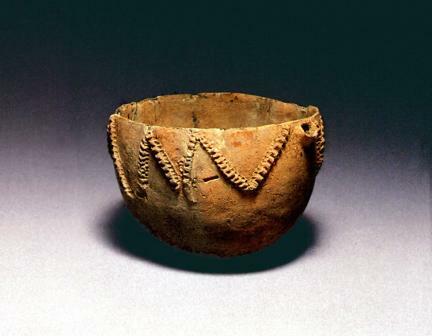 This earthenware bowl, discovered in a shell mound at Yeongseon-dong, Yeongdo-gu, Busan, dates from the Neolithic period. The item measures 12.4㎝ in height and 16.4㎝ in mouth diameter. The bowl has a spout at one side of the mouth so that liquid content can be safely poured out of it. The item is noted also for the raised appliqué design located below the mouth edge, on the outside. The appliqué design consists of a clay strip placed in a manner to form a jagged line, and the surface of the clay strip is indented at regular intervals, for a greater decorative effect. The bowl is made in ochre-colored clay and becomes darker in hue toward the bottom. Earthenwares of this type were made in the early part of the Neolithic period. Other similar items with raised appliqué designs have been discovered at the same shell mound in Busan.